➡ View the complete range of Cembre Hydraulic Cutting Tools – the Cembre hydraulic range of cable cutting tools are designed for the cutting of LV, MV and HV power cables, control and instrumentation with steel wire armour, braid or unarmoured. Compatible with XLPE, EPR, PILC type cables and subsea umbilicals. Hydraulic cutting tools achieve a smooth, straight cable cut including armoured and lead sheathed cables without damaging or deforming the copper or aluminium conductor prior to jointing or terminating cables. 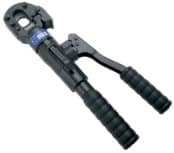 Cembre hydraulic cable crimping tools are also available to suit all applications. Thorne & Derrick can provide expert tool recommendations to ensure customer selection of the most suitable hydraulic cutting tool for the cable application – contact us to discuss your requirements. T&D have been Official Distributors for Cembre since 1985 – full range of hydraulic cutting tools are available for delivery to UK and international destinations from stock; battery operated cable cutters also available for up to 95mm outside diameter cables. 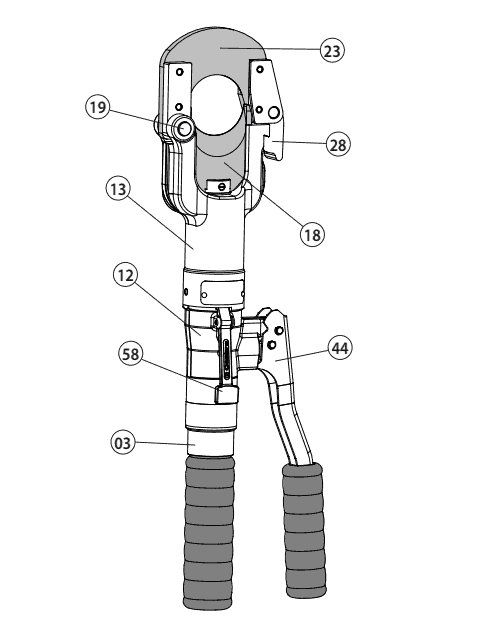 The following figure shows the component parts and features common to hydraulic cutting tools – pictured below is Cembre HT-TC051 model. The cutting tools feature an advancing speed setting automatically switching from a fast advancing speed of cable cutting blades to a slower cutting speed – tools are provided with a maximum pressure valve (MPC1 manometer is available upon request to check the proper setting of the valve).